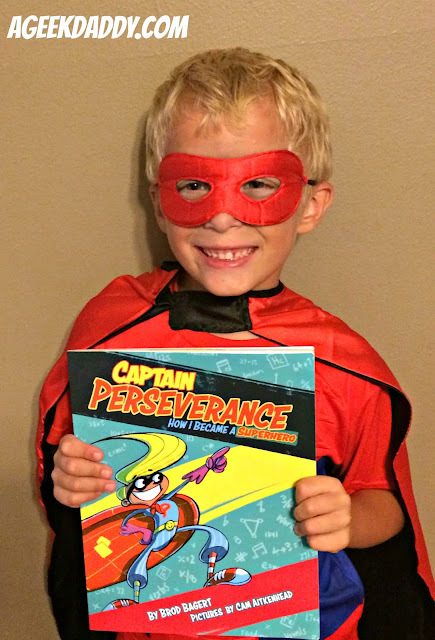 A Geek Daddy is today's stop on the CAPTAIN PERSEVERANCE -- HOW I BECAME A SUPERHERO online book tour. 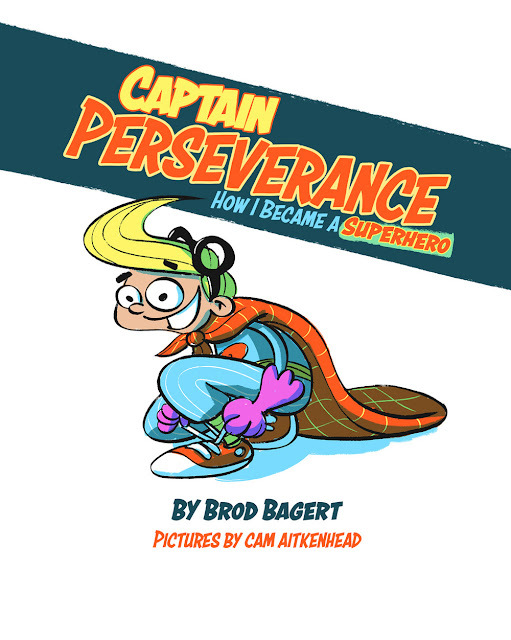 This super hero themed book combines the high-energy illustrations of artist Cam Aitkenhead with the inspiring text of poet Brod Bagert to show children that chores and tasks that they may consider as drudgery now with perseverance will lead to future success. 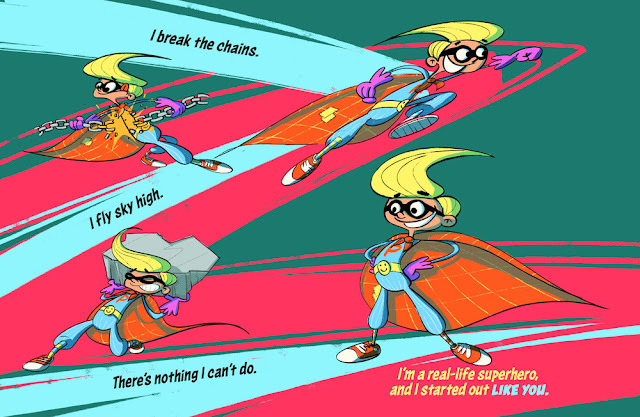 Learning long division in fourth grade, completing a fifth grade science fair entry, and trying out for band in the sixth grade are examples that the main character perseveres through to achieve the successes he wants in life and which young readers can identify with to inspire them to strive to be super themselves. The story shares with kids an encouraging message that while life may be confusing and difficult at times these experiences provide the important building blocks in developing the skills to get you ahead in life. The Captain reminds us all that everyone struggles at things "but I've learned that PERSEVERANCE is a special kind of friend. I'm spinning in the middle, but winning in the end." I’ve written poetry all my life, but it never occurred to me that I might actually do it for a living. Instead I became a trial lawyer and was elected twice to the New Orleans City Council. When I ultimately lost an election for higher office, I was surprised to discover that I felt a sense of relief. 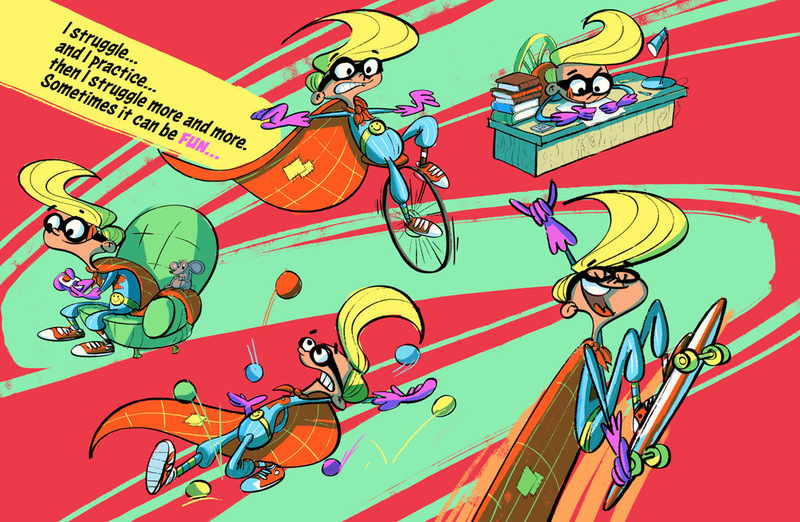 I was able to spend time with my children and eventually began writing poems for them to recite in their elocution programs at school. Back then, most children’s poetry was written in the voice of an adult talking to children, which made it hard for children to recite. The poems I wrote for my children were in their own voices, expressing their real feelings about actual events, each ending with a funny twist. Pretty soon people started asking me to write poems for their children, the whole thing took on a life of its own, and before long I had closed my law office and become a full-time, professional poet. That was 24 years ago, and I’ve never looked back. I've published 18 books of poetry -- five for adults, two for young adults and eleven for children. What has been the greatest influence on your writing? I learned to manage the sound of poetry from Homer. His Odyssey, in the original Greek, is possibly the most exquisitely lyrical poetry ever written. During my first two years of high school we were required to read it aloud, often memorizing the most beautiful passages. The influence was inevitable. Also in high school, translating Horace’s Ars Poetica (The Art of Poetry) shaped my basic thoughts about the nature of poetry. I also experienced specific influences from among the poets writing in English: Robert Frost for the metaphorical story, Emily Dickinson for quiet power, William Butler Yeats for flashes of lyrical magic, and Shakespeare for serious-playfulness. A three word critique of one of my college poems by American poet Miller Williams was particularly encouraging. As he approached my desk, my poem in hand, about to begin his appraisal, I braced myself for the verbal-Armageddon to which the members of our class had become accustomed. Instead he handed me the paper and said, “Do it again.” My early work-life experiences do indeed show up in my work. When I write a poem in the voice of a child, my old lawyer’s sense of advocacy and fiduciary obligation kicks in and makes sure that I represent that child’s point of view 100 percent. And for me, in a lot of ways, a poem is like a political stump speech. If the people don’t understand what you’re trying to say, the speech won’t work. So when I write a poem I want my reader (or listener) to get it the first time through. And if they’re inclined to dig a little deeper, I want to make sure they find a gem or two with each turn of the shovel. I usually try to bury enough cool stuff to provide an English major with a few hours of happy explication, but I never—never—want to write something that might make my reader feel inadequate. What are some of the projects you are currently focused on? Captain Perseverance, the hero in my most recent book, is the first of three superheroes who are all members of the Grit Alliance. Next comes Major Effort, then Commander Diligence. Also, for the last 20 years I’ve been working on an outrageously ambitious science thing I call the Muse Project. The idea is to give teachers a body of fictional performance material (poems, plays, monologues, dialogues, and songs) that teaches real science in detail, the entire science curriculum. I’ve already completed 240 of the 270 or so pieces it’ll take to cover the material and have begun brainstorming the most effective media to get it into the hands of America’s teachers. Can a poem or picture book really make a difference in the life of a child? Absolutely! It's the power of the parable that great teachers have always understood. In Captain Perseverance, children identify with the main character as he struggles with challenges he faces in school. They experience the action of the story as though it were actually happening to them and walk away with an intellectual and emotional grasp of the power of perseverance. It’s probably a good idea to read "Strunk and White’s The Elements of Style" every six months, and read it out loud. Writers should be learners. Not just dabblers, but full-power seekers of eclectic of knowledge. My personal remedy for writer’s block is to use learning as a catalyst. When I learn, I think. When I think, I have something to say. When I have something to say, I write. Find out who you are and what you want to say before you die. One of my shortest poems is a three-line piece I wrote in the middle of the night, in a cold, wet sleeping-bag, in a tent, on the shore of Glacier Bay in Alaska. I write by flashlight in the dark. Writers don’t live forever, and the writing we leave behind is what we are. Make sure what you write is how you want to be remembered. Now you know a bit more about the story and its author check out illustrations from the book and some interesting behind the scenes perspectives about the creation of CAPTAIN PERSEVERANCE by clicking here. CAPTAIN PERSEVERANCE is now available from Amazon, Barnes & Noble, Kobo, and iBooks and keep an eye out for additional adventures featuring the Grit Alliance coming soon. Stop by Ice Fairy's Treasure Chest on Monday, September 12th for the next stop on the CAPTAIN PERSEVERANCE online book tour.